Et Alia at The Red House | Riverside Italian Restaurant in Chester, Cheshire. Welcome to Et Alia at The Red House – an Italian riverside restaurant and bar in Chester. Situated on the picturesque banks of the River Dee, Et Alia at The Red House is a fusion of old and new which blends to create a dramatic and romantic setting for any occasion. 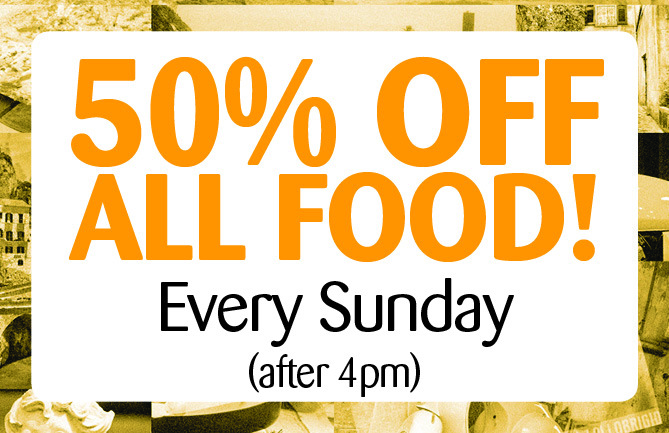 Sunday 50% Offer is subject to terms and conditions and does not apply on Mothers Day. Our mission and aim is to create a neighbourhood restaurant that our local friends and residents can be proud of. Our relaxed, friendly approach coupled with the contemporary, stylish interior and lush green gardens and terrace provides the perfect setting for a great dining experience, whatever the weather. We are obsessed with creating beautiful, authentic Italian dishes using daily deliveries of the finest, freshest ingredients and specially imported authentic Italian produce. With chefs from varying regions of Italy, we blend authentic flavours and ingredients with passion and culinary expertise to create the most talked about Italian dishes in Chester. Handcrafted pizzas are made fresh to order in our burnt orange pizza oven, creating culinary theatre within the restaurant. Perfect pasta dishes, 28 day aged beef and fresh fish daily specials create a medley of flavours that prove irresistible to our diners. Expertly crafted dolci desserts including choux pastry specials and our famous home made Tiramisu provide the flawless finish to your dining experience at Et Alia. Our mezzanine cocktail bar boasts hand picked wines, traditional Italian beers and the very best team of cocktail maestros to start or finish your experience at Et Alia. Relaxing as the sun sets on our outdoor terrace area is always a highlight for visitors to Et Alia as they drink, dine and devour the unique atmosphere of the River Dee landscape. We book up well in advance, particularly on weekends so reservations are highly recommended. To reserve your table at our Chester Italian restaurant, call the Et Alia at The Red House team on 01244 320088.